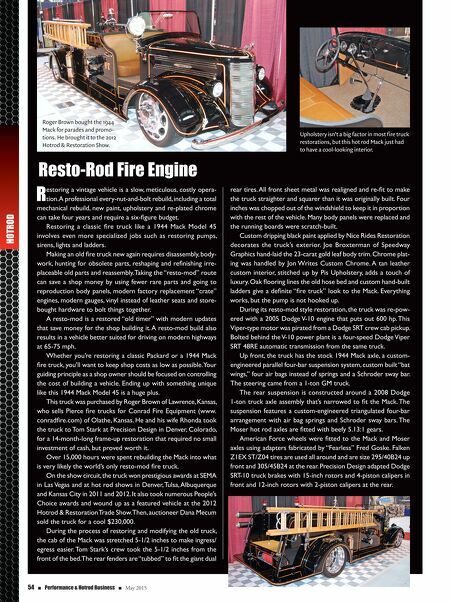 54 n Performance & Hotrod Business n May 2015 HOTROD R estoring a vintage vehicle is a slow, meticulous, costly opera- tion. A professional every-nut-and-bolt rebuild, including a total mechanical rebuild, new paint, upholstery and re-plated chrome can take four years and require a six-figure budget. Restoring a classic fire truck like a 1944 Mack Model 45 involves even more specialized jobs such as restoring pumps, sirens, lights and ladders. Making an old fire truck new again requires disassembly, body- work, hunting for obsolete parts, reshaping and refinishing irre- placeable old parts and reassembly. Taking the "resto-mod" route can save a shop money by using fewer rare parts and going to reproduction body panels, modern factory replacement "crate" engines, modern gauges, vinyl instead of leather seats and store- bought hardware to bolt things together. A resto-mod is a restored "old timer" with modern updates that save money for the shop building it. A resto-mod build also results in a vehicle better suited for driving on modern highways at 65-75 mph. Whether you're restoring a classic Packard or a 1944 Mack fire truck, you'll want to keep shop costs as low as possible. Your guiding principle as a shop owner should be focused on controlling the cost of building a vehicle. Ending up with something unique like this 1944 Mack Model 45 is a huge plus. This truck was purchased by Roger Brown of Lawrence, Kansas, who sells Pierce fire trucks for Conrad Fire Equipment (www. conradfire.com) of Olathe, Kansas. He and his wife Rhonda took the truck to Tom Stark at Precision Design in Denver, Colorado, for a 14-month-long frame-up restoration that required no small investment of cash, but proved worth it. Over 15,000 hours were spent rebuilding the Mack into what is very likely the world's only resto-mod fire truck. 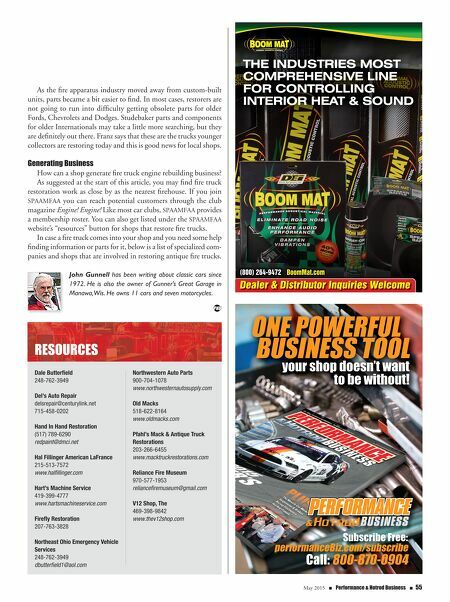 On the show circuit, the truck won prestigious awards at SEMA in Las Vegas and at hot rod shows in Denver, Tulsa, Albuquerque and Kansas City in 2011 and 2012. It also took numerous People's Choice awards and wound up as a featured vehicle at the 2012 Hotrod & Restoration Trade Show. Then, auctioneer Dana Mecum sold the truck for a cool $230,000. During the process of restoring and modifying the old truck, the cab of the Mack was stretched 5-1/2 inches to make ingress/ egress easier. Tom Stark's crew took the 5-1/2 inches from the front of the bed. The rear fenders are "tubbed" to fit the giant dual rear tires. All front sheet metal was realigned and re-fit to make the truck straighter and squarer than it was originally built. Four inches was chopped out of the windshield to keep it in proportion with the rest of the vehicle. Many body panels were replaced and the running boards were scratch-built. Custom dripping black paint applied by Nice Rides Restoration decorates the truck's exterior. Joe Broxterman of Speedway Graphics hand-laid the 23-carat gold leaf body trim. Chrome plat- ing was handled by Jon Writes Custom Chrome. A tan leather custom interior, stitched up by Pis Upholstery, adds a touch of luxury. Oak flooring lines the old hose bed and custom hand-built ladders give a definite "fire truck" look to the Mack. Everything works, but the pump is not hooked up. During its resto-mod style restoration, the truck was re-pow- ered with a 2005 Dodge V-10 engine that puts out 600 hp. This Viper-type motor was pirated from a Dodge SRT crew cab pickup. Bolted behind the V-10 power plant is a four-speed Dodge Viper SRT 48RE automatic transmission from the same truck. Up front, the truck has the stock 1944 Mack axle, a custom- engineered parallel four-bar suspension system, custom built "bat wings," four air bags instead of springs and a Schroder sway bar. The steering came from a 1-ton GM truck. The rear suspension is constructed around a 2008 Dodge 1-ton truck axle assembly that's narrowed to fit the Mack. The suspension features a custom-engineered triangulated four-bar arrangement with air bag springs and Schroder sway bars. The Moser hot rod axles are fitted with beefy 5.13:1 gears. American Force wheels were fitted to the Mack and Moser axles using adapters fabricated by "Fearless" Fred Goske. Falken Z1EX ST/Z04 tires are used all around and are size 295/40B24 up front and 305/45B24 at the rear. Precision Design adapted Dodge SRT-10 truck brakes with 15-inch rotors and 4-piston calipers in front and 12-inch rotors with 2-piston calipers at the rear. Resto-Rod Fire Engine Roger Brown bought the 1944 Mack for parades and promo- tions. He brought it to the 2012 Hotrod & Restoration Show. Upholstery isn't a big factor in most fire truck restorations, but this hot rod Mack just had to have a cool-looking interior.